We are pleased to announce that, as of this September, attendees of our Canoeing in the Ardeche expeditions will be given the chance to earn their BCU Star Awards during their course. These Paddlesport Performance Awards will help you gain the control and experience necessary for you to embark on your own wilderness canoeing expeditions, making them an excellent addition to our current course syllabus. 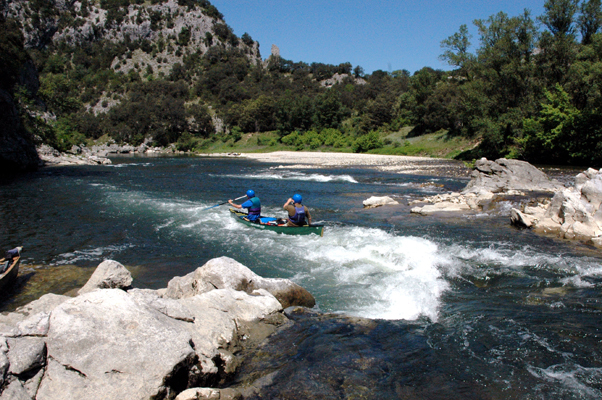 If you’d like to gain these qualifications, surrounded by the stunning scenery of the Ardeche Gorge this September, please book one of the few remaining places available here. The British Canoe Union altered their assessment system in 2007, making it compulsory to be tested in both canoe and kayak for their 1 Star and 2 Star Awards. From this year though, we are able to provide our clients with a kayak to achieve these awards. Plus, if you have some prior experience of paddling canoes, you may be able to achieve your 3 Star award during the course as well. This entry was posted in Bushcraft Courses & Expeditions, Site Announcements on July 11, 2011 by Woodlore Team.